Since moving abroad, I have learned how to substitute certain ingredients. When I need molasses, I use pekmez - a Turkish grape molasses. For sour cream, I use süzme yoğurt - a thick, strained Turkish yogurt. This yogurt also makes tasty dips such as cacik - the classic Turkish cucumber and yogurt dip/sauce. I've been wanting to make a cheesecake for a while haven't had the time lately. When I did set adie some time the other day, I picked up some Turkish labne to substitute for cream cheese. Labne is a spreadable cream cheese made from strained yogurt. You really can't tell the difference in taste. Some stores do sell Philadelphia Cream Cheese at a price - about 12 lira for a 3 oz. package! Just think of how many small packages you must buy to make a cheesecake! However, I bought this tub of labne for about 7 lira. the taste would be similar to what I wanted. my food processor to make the crust of the cheesecake. cheesecake with a hint of citrus and chocolate. It was just the way I like it! I set aside a small portion of the batter to make this 4-inch cheesecake for my husband. I garnished it with toasted hazelnuts. in a water bath later. browned around the edges. Set aside to cool. cream together until well blended. 4. Next, mix in the krema, lemon zest and flour, and blend again. bowl now and then to prevent any lumps in your mixture. 6. Lastly, mix in the melted chocolate. 7. Pour the mixture into the crust-lined pan. 8. Place the pan onto a larger tray with sides and fill the tray with about 1/2-inch of water. of 400 F/200 C for 10 minutes. so the internal temperature can drop. oven for 1 more hour. Chill. to cut into perfect slices. Just want to know if suzme can be cooked/baked like sour cream? Yep, I've pretty much always used suzme in place of sour cream even in enchiladas and such. It can be thinned out with a little milk or cream if you want as well. Cheers! could you please write a blog on how you make enchiladas in turkey. i am from america as well and currently living in istanbul. im having trouble making mexican food. do you have recipes? Hi Anonymous, It's been awhile since I've made enchiladas. Just got to make a tomato sauce from scratch, fill with meet and top with kasar cheese. Also, I'd recommend checking out the Facebook page of Cooking Corner in Turkey. Lots of great advice there. I once read in a Turkish cooking magazine that they made sour cream by mixing equal parts Suzme yogurt with krema, stir & let sit for 4 hrs. It's really good! Softens the yogurt sharpness to more of a creamy sour-cream. I haven't cooked with it though. Also, there's a 200g packet of Taze Pastorize Beyaz Peynir (Pinar brand) in the cheese section that many friends use for cream cheese & cheese cakes. Have you tried that compared to the labne? I looked for the Facebook group/page but couldn't find it...Is that the full name "Cooking Corner in Turkey/"
The taze krem peynir is very expensive compared to labne here, and I think it has a slightly gummy texture compared to Philly American Cream Cheese. That's why I prefer to use labne and I add flour for a thickening agent. "In a screw-top jar or mason jar with lid, combine the heavy cream and sour cream (or buttermilk). Shake the ingredients up a bit to thoroughly mix and let stand, covered, at room temperature for about 24 hours or until it becomes very thick. You can store your sour cream in the refrigerator in the original jar you mixed it in (or use some other resealable container) for up to one week. Make sure that your sour cream is well chilled before using." Happy to hear my cheesecake is Kwan approved! 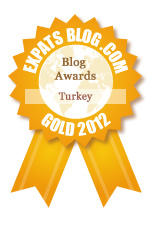 This was probably my most requested recipe from expats in Istanbul! Afiyet Olsen!